Does it seem like no matter what you do, your weight just keeps climbing higher and higher? If that’s the case for you, then it’s time to take a good hard look at some of the habits you have in place as these could be contributing to the problem. Many people think that they’re doing everything ‘right’ with their diet and workout plan, but are actually making a few errors that cost them their results. Bad habits can sometimes pass you by and in many situations, you may not even realize that you’re doing them. Add to the fact that bad habits are quite hard to break and you could have a real problem on your hands. Let’s take a closer look at a few bad diet habits that very likely could be causing you some unwanted weight gain. The first bad habit that you must refrain from doing is believing absolutely everything that you read. If you do this, you’re going to get very overwhelmed, very quickly. There is so much information – most of it conflicting information on what you should and shouldn’t be doing to lose weight. It’s important that you only listen to credible sources and if you’ve found one credible source that you trust, listen to them only. While this doesn’t mean you need to completely tune out any other information, be careful when you hear it. Remember that there are a number of ways to diet to lose fat, so one method is not necessarily superior than another. But if you’re constantly jumping from one method to the next, then this will cause problems as it is. The second bad habit you must break if you’re currently doing it is always opting for low fat, highly processed foods instead of fresh unprocessed food. Low fat (processed) foods, while they may seem healthy, are sometimes not. If you’re choosing foods that are naturally fat free, then they will be fine to consume since nothing has gone in to replace the fat that was removed. But if you’re eating commercially prepared fat free foods that have higher fat counterparts, tread lightly. Often added sugar will be present to help enhance the taste now that fat is missing or else there will be other artificial sweeteners added instead. And be sure to be choosing something that doesn’t come from a box or can once in awhile. Finally, the last thing that you need to concern yourself with is if you ever put price over your health. Do you often indulge in all the free foods given out in restaurants or as samples at stores? If the bread basket arrives and you attack since you don’t have to pay for the food, this is seriously going to do your waistline harm. Likewise, if you’re making sure to clean your plate after each and every meal you consume just so food doesn’t go to waste, that too will cause you to eat more calories than you likely need. Instead, always listen to your body. Only eat what it needs, regardless of cost. So there you have three bad health habits that you must stop immediately if you want to see success with your weight loss goals. Have a look and see if any of these are influencing you. 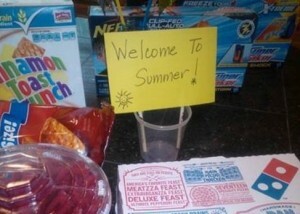 I saw this pic with the caption “A surprise for the kids after school today – its summer!! !” on someone’s Facebook post today. And the person who posted it has gotten 30 likes and many affirming “you are an awesome mom, what a great idea!” comments. 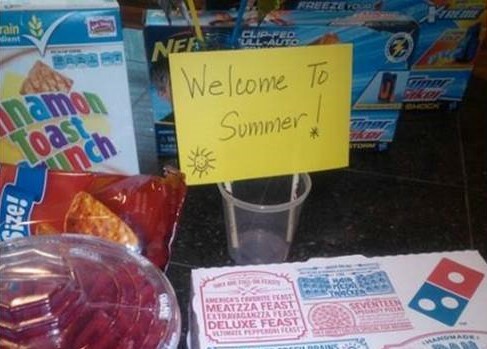 As a professional who helps adults “unlearn” patterns of emotional eating so they can get to a healthy weight, this is disturbing.Emotional eating patterns are learned: A kid who is given a junk food “surprise” like this learns to associate junk food with summer fun. A child who is given candy after a big accomplishment may grow up using candy as a reward for a job well done. A kid who is given cookies as a way to stop crying may learn to link cookies with comfort. So, as an adult realize that this is why you may connect food and fun. As a parent, please help your kids associate fun, accomplishment and comfort with something other than food.